stock charts with realtime quotes! using smart phones, tablets and desktop browsers. The lowest online trading fee gives you better return. Want a fully customized free stock charts with many technical indicators? Want 20 year of historical and intraday stock chart? How about ability to draw or make note on chart? We have it here. Understand the need of real-time stock quotes for day trader, we bring in real-time quotes to our fully customized stock charts product. Why spend more when you can do online trading for only $3.49/order ? 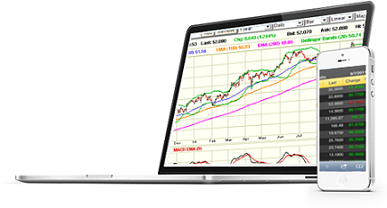 Yes, we will let you trade online from within your realtime stock chart account with us. Need access to your stock chart and trading account on the move, our mobile stock charts product will satisfy your need. Using RealtimeStockquote.com products and services, you will experience a fast access and user-friendly streaming realtime stock quotes tracking system, fully customized technical realtime stock charts with several technical indicators that requires no download, no applications to install. All you need is an internet connection and a web browser (some products may require Java), and you are ready to start creating your own fully customizable watchlist, stock charts, stock quotes, email stock quotes alerts, etc. Our realtime mobile stock charts and stock quotes product keeps you well informed of stock market movement when you are on the move with your iphones, ipads or other smart phones and tablets. We will connect you with an online trading platform which offers the lowest fee per trade. You can trade within our product while viewing your favorite stock chart movement. This will help to maximize your profit of your stock & ETF investments. We also try our best to provide you with an affordable realtime stock charts and stock quotes services. You can even view realtime stock charts, realtime stock quotes with customizable watchlist for free!